Last spring, Cogswell ASB held its annual elections for a new officers. Running unopposed, Samantha Silvers and Cheyenne Mikailli were elected President and Vice President, respectively. Silvers and Mikailli collaborated with the exiting ASB Executive Board to form their new cabinet of ASB Officers comprised of both veterans and new members. Judith Carpio was elected ASB Treasurer after training in the position for two semesters. Carpio joined ASB last fall and became the sole trainee for the Treasurer position. She has experience both in ASB and clubs, being an active member of Cogswell GSA and Pokemon League. Carpio believes that both ASB and clubs can benefit from less leniency and plans on being more strict when it comes to treasury policies. “As the new treasurer, I want to do my best to stick to the policies we have outlined in the ASB constitution,” she tells the Chronicle. The previous ASB Executive Board had numerous internal problems regarding funds, something Carpio says she is working hard to avoid. Carpio hopes that students will be more aware of what funds they have access to, including those allocated for non-club activities. ASB allows students to make one-time purchase requests for events or projects that benefit other students. Angel Ramirez worked with President Silvers to remodel the ASB Office to be more inviting. He served as an ASB Associate for more than a year in the previous administration and had valuable insight about Student Life culture on campus. “We wanted to make the ASB office more accessible to students and be more inviting, especially since we lost the old Whisper Room,” Ramirez tells us. The meeting table now lays horizontally in the room, dividing it to the front half, which is accessible to all students, and the back half, which is for ASB officer use and club storage. The walls have also been repainted to give the room more life with neutral colors and a fresh look. Ney Hoato was elected ASB Event Coordinator, a critical role for the Exec Board. “As the Event Coordinator, I plan to make events more engaging in terms of being more hands on and inclusive,” Hoato tells the Chronicle. ASB will be pushing some smaller events in the fall to keep students excited. Hoato teased us about a “bone chilling” event around Halloween season. Last year’s Medieval Tournament was revamped as “Witchcraft & Wizardry”, inspired by the Harry Potter series. 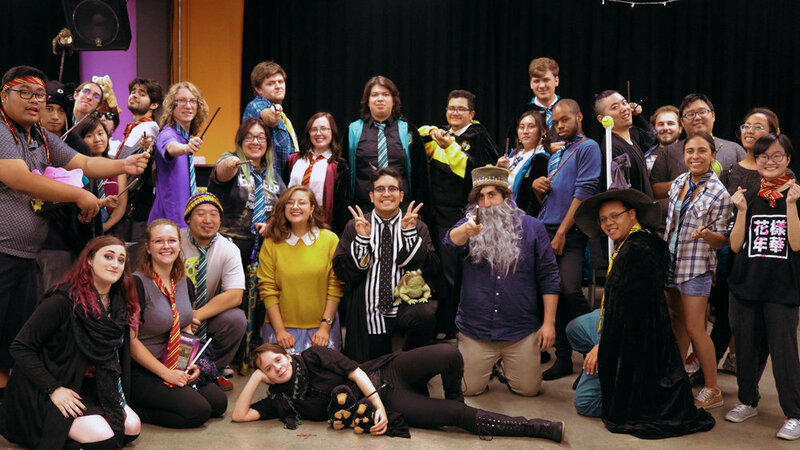 Hoato is involved with many organizations on campus, including the Cogswell Collective, Pokemon League, and GSA. Hanna Gonzalez returns to the Exec Board as the ASB Publicist, a role she shares with newcomer Kelly Daley. Both ASB Publicists will share tasks such as social media engagement and poster-design. Gonzalez is an experienced officer for the Cogswell Chronicle and Cogswell Collective and has served as the ASB Publicist for one term. Daley is an involved member of the school’s eSports Club. "I'm looking forward to being a part of the ASB family," says Daley. She explains that while she is enthusiastic about her role as Publicist, working with the new Exec Board is very exciting. Cogswell ASB is looking for associates to join their Executive Board. Students interested should email President Silvers at ssilvers@cogswell.edu.